7" long, and 5.5" relaxed circumference stretches to 10"
For several years I took an intercollege bus a few times each week, and had to stand at the side of the road waiting for it to arrive. My previous fingerless mitts were short and left a gap between my wrist and my coat sleeve when I knit. Thus, I needed a new pair of mitts. 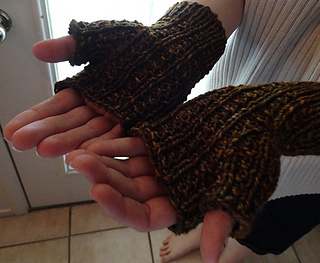 But I wanted them to be simple, yet interesting, and despite the many many many mitts patterns out there, none of them were quite what I wanted. So I experimented, and this is the result. Well, it was the result. I wrote this pattern back in 2010, and years later decided that my thumb knuckle was cold… so I enhanced the pattern. Now the finger-free mitts can be made with (thumb-ful!) or without thumb gussets. The pattern has written directions and both right- and left-handed charts. Needles: use double-points or two circs or magic loop. 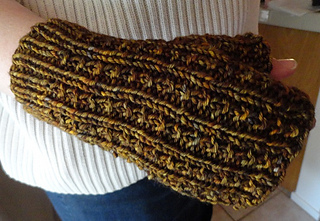 Stitches: just knit, purl, and twisted stitch (for most people, knit through the back loop). 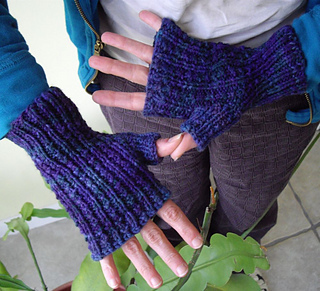 It is easy to modify the length of these mitts and less easy to modify their circumference.